For computer chassis, see Computer case. A chassis (US: /ˈtʃæsi/, UK: /ˈʃæsi/; plural chassis /-iz/) is the framework of an artificial object, which supports the object in its construction and use. An example of a chassis is a vehicle frame, the underpart of a motor vehicle, on which the body is mounted; if the running gear such as wheels and transmission, and sometimes even the driver's seat, are included, then the assembly is described as a rolling chassis. In the case of vehicles, the term rolling chassis means the frame plus the "running gear" like engine, transmission, drive shaft, differential, and suspension. An under body (sometimes referred to as "coachwork"), which is usually not necessary for integrity of the structure, is built on the chassis to complete the vehicle. For commercial vehicles, a rolling chassis consists of an assembly of all the essential parts of a truck (without the body) to be ready for operation on the road. The design of a pleasure car chassis will be different from one for commercial vehicles because of the heavier loads and constant work use. Commercial vehicle manufacturers sell "chassis only", "cowl and chassis", as well as "chassis cab" versions that can be outfitted with specialized bodies. These include motor homes, fire engines, ambulances, box trucks, etc. In particular applications, such as school buses, a government agency like National Highway Traffic Safety Administration (NHTSA) in the U.S. defines the design standards of chassis and body conversions. An armoured fighting vehicle's hull serves as the chassis and comprises the bottom part of the AFV that includes the tracks, engine, driver's seat, and crew compartment. This describes the lower hull, although common usage might include the upper hull to mean the AFV without the turret. The hull serves as a basis for platforms on tanks, armoured personnel carriers, combat engineering vehicles, etc. In an electronic device (such as a computer), the chassis consists of a frame or other internal supporting structure on which the circuit boards and other electronics are mounted. In some designs, such as older sets, the chassis is mounted inside a heavy, rigid cabinet, while in other designs such as modern computer cases, lightweight covers or panels are attached to the chassis. The combination of chassis and outer covering is sometimes called an enclosure. In firearms, the chassis is a bedding frame on long guns such as rifles to replace the traditionally wooden stock, for the purpose of better accurizing the gun. The chassis is usually made from metallic material such as aluminium alloy due to the more superior stiffness and compressive strength of metals compared with wood or synthetic polymer, which are commonly used in conventional rifle stocks. The chassis essentially functions as a more extensive pillar bedding, providing a metal-on-metal bearing surface for the that has reduced potential shifting under the stress of recoil. A barreled action bedded into a metal chassis would theoretically operate more consistently during repeated firing, resulting in better precision. 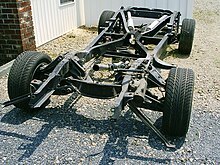 Look up chassis in Wiktionary, the free dictionary. ^ Company, Houghton Mifflin Harcourt Publishing. "The American Heritage Dictionary entry: chassis". www.ahdictionary.com. Retrieved 2017-05-21. ^ "Chassis definition and meaning | Collins English Dictionary". www.collinsdictionary.com. Retrieved 2017-05-21. ^ Association of Licensed Automobile Manufacturers (U.S.) (1922). Official Handbook of Automobiles. National Automobile Association. p. 180. OCLC 6360726. Retrieved 10 September 2010. ^ Sturmey, Henry (2 April 1908). "The Use of Unsuitable Vehicles". Commercial Motor. 7 (160): 146–147. Retrieved 10 September 2010. ^ Grenzeback, Lance R.; Lin, Sandi; Meunier, Jacob (2005). Operational Differences and Similarities among the Motorcoach, School Bus, and Trucking Industries. Transportation Research Board. p. 13. ISBN 978-0-309-08821-3. Retrieved 10 September 2010. ^ Starry p. 45, 79, 129, 143, 153, etc. ^ Khandpur, Raghbir Singh (2006). Troubleshooting Electronic Equipment. McGraw-Hill Professional. p. 45. ISBN 978-0-07-147731-4. Retrieved 10 September 2010.